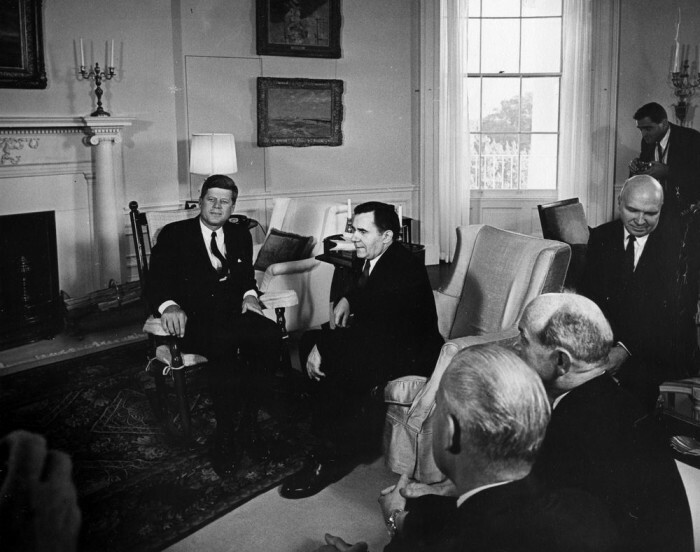 President John F. Kennedy Meets with Andrei Gromyko, Minister of Foreign Affairs of the Soviet Union (USSR), 6 October 1961. (Clockwise from top): President Kennedy; Andrei Gromyko; Vladimir Semenov, Deputy Minister of Foreign Affairs of the Soviet Union; Secretary of State Dean Rusk (back to camera); Mikhail Menshikov, Soviet Ambassador to the United States (back to camera). Photographer in background. Yellow Oval Room, White House, Washington, D.C.